Developers would be given density bonuses for building residential units for mid and lower incomes under a newly approved zoning change. Miami commissioners voted last week to approve the new rules. The bonus only applies to an area west of the Arsht Center zoned T6-24B-O. Several properties in the area, including Melo Group’s Square Station and Art Plaza, have already been given similar bonuses in exchange for agreeing to offer apartments to tenants with specific income levels. Three income levels will be considered: Workforce (60 to 140 percent of area median income), Affordable (Below 60 percent of AMI), and Extremely Low Income. Additional bonuses can be granted by devoting more space to Extremely Low Income. Miami’s area median income is about $52,300 for a family in 2018. Developers could easily increase the amount of lower income units if they weren’t forced to met parking requirements and pay to reduce the amount of parking. Let the market sort this out. I agree. They should be given parking maximums not minimums with special exemptions for more parking. Careful what you wish for.. the “market” wants MORE parking.. residents hate dealing with guest parking issues or getting their cars towed on the street. Some people may down vote you but you’re exactly correct. Parking is no free, so if you want to pay an extra $50,000 for a spot, that’s your choice. That’s what a spot costs to build in a garage. Not if your low-income and can’t afford a car anyways. The market wants more until developers tell everyone they have to PAY for 3 spots. Statement doesn’t make sense. Developers aren’t subject to parking caps. If what you said were valid, your scenario would have happened already. If you removed minimum parking requirements and minimum unit size more cheap apartments would be built. Most downtown people who make more than 140% of AMI would demand more parking, true. Those people do not need help. People under 60% of AMI dont need two parking spaces and a 650sq ft apartment. Having been poor, I can tell you, that having your own place, no matter how small, is empowering. An apartment close to a job, clean, safe, and cost effective is what you need for this period in one’s life. Sadly, zoning laws that set minimums hurt the Free Market, and they hurt the people who most need help. The market will sort this out? Sure. The invisible hand always works! I mean, look at 2008 and 2009! That was the best economy ever thanks to the invisible hand! The markets are irrational. Who can afford these prices right now? There will eventually be a crash because of the greed of these folks. If you say otherwise, invest in real estate now. Just don’t ask for the government to help. What you said, “The markets are irrational” and “Just don’t ask for the government to help,” doesn’t make sense. The government lowered the standards for people who should of never owned a home to buy a home so the government caused the crash. Let the market be free. The gov’ did not cause the crash. it was investor demand for mortgage backed securities (MBS) that caused the crash. With more demand for MBS the more relaxed the guidelines for loans to subprime, and that my friends is how you get a real estate bubble. This video explains it very well and easy to understand. Highly recommend you watch it. Overall….good video. At the lightbulb moment, they fail mention how Gov’t policy and the CRA effected the drive to make NINJa loans, etc. What happened was FAR from a Free Market construct. The banking crisis of 2008 was not a result of a Free Market. Study the CRA. You will find that the Gov’t REQUIRED banks to make loans to people they would otherwise find too risky to make loans. Banks aren’t stupid. If REQUIRED to make risky loans, they will find a way to get them off the books before they explode. Gov’t should not REQUIRE banks to loan to anyone. The Gov’t. Should not REQUIRE developers to build sizes the Gov’t thinks is suitable. A&E District is about to blow up with Canvas, 4 Melo building, J. Milton & Associates, N.R. Investments, building up the area. Inclusionary Zoning is good idea.. gives younger folks, gov’t employees, and others that are starting up a chance to live downtown… will bring more density to urban area. What ever happened to gloria estefan proposed office and party tower. 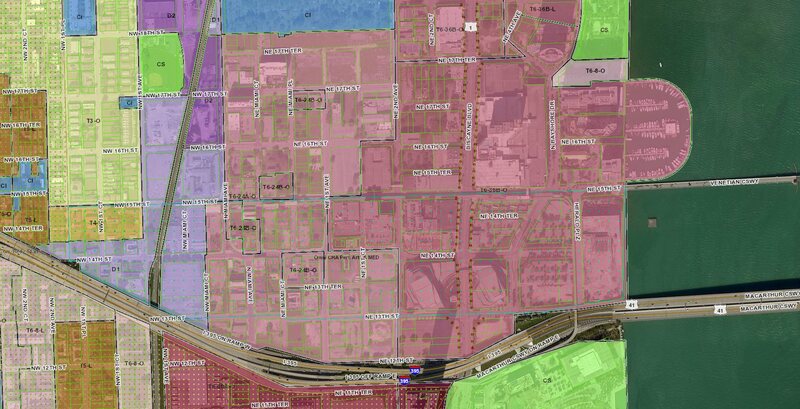 Good decision, but more, a lot more areas zoning throughout the city need to undergo changes like this. Only an experiment for now. “Experiment?” There is so much that has to be done in this city if people want it to be truly world class. Unfortunately, Miami suffers from others stubborn stupidity. and Melo has already been on top of it ! Repeat after me. Parking maximums, not minimums. They think it makes them appear intelligent when they mention something about parking. They should implement it around all City’s the Metrorail stations and the North East Trirail future corridor. Sorry but that makes too much sense. Density, parking, and other relief is given to Transit Oriented Developments. Forcing another layer of regulation on builders is NOT a good idea. I embrace this concept.. let’s see if this is a viable solution to affordable housing problem. I don’t know why it’s taken so long for something like this to develop. Another incentive would be to cut parking and encourage more ride-share, app-mobility and mass transit in the area in exchange for more density. This should be the way to go not the exception. Cutting parking will allow developers to add more resident floors and not parking garage floors. The city refuses to get to the root of the problem. great news now let’s build! Well, if everyone thought like you, nothing will get done. I rather live in the ghetto than in boring alligators infected DeSantis monochromatic suburbia. Term to describe where a minority group live, typically as a result of social, legal, or economic pressure… originally been used to restricted and segregate Jews. Forget it.. that anonymous person above that said “from one ghetto to another decades apart” is a rich snob who lives on Fisher Island. Nah.. probably lives in Hialeah. “Alligators infected DeSantis monochromatic suburbia?” Didn’t west Broward vote overwhelmingly for that pinko Gillum? No you wouldn’t because you don’t want your rims stolen or your car jacked or your gold chain yanked from your neck by someone ready to sell it off to score some junk. And don’t call me racist. Ghetto doesn’t mean just black neighborhoods anymore. Look at east Little Havana around 12th or 7th avenue, or East Hialeah. The same crap can easily happen there. Plenty of affordable housing exists with transit access. It’s just people are racist and don’t want to live in Opa-Locka Brownsville, West Little River, etc. Meanwhile, opposing failed policies like inclusionary zoning and letting markets decide is apparently NIMBY racism Look at San Fransicko for how bad this policy is, where Nob Hill borders the rent-controlled Tenderloin, and crackheads cause all sorts of trouble. WTF is DeSantis Jr. Talking about? Critical thinking and proven examples. Something granola-munching neckbeard Gilliumites can’t comprehend.